Today, we’re hearing from Katie Hone, a homeowner from Ipswich, Massachusetts that used a grant from Parker River National Wildlife Refuge to convert her waterfront home into a woodland oasis, dotted with native shade gardens, monarch butterfly way stations, and a setting where her two young children can have close encounters with nature. The grant is part of the refuge’s award-winning Slow the Flow campaign, which engages the local community to conserve water, reduce invasive plants, promote backyard wildlife habitat, and prevent nutrients and pollution from entering the Plum Island Estuary. We’re sharing a post from Katie’s blog; get some some pointers on how to raise monarch butterflies, familiar orange-and-black insects, admired for their flights of up to 5,000 miles a year, which are currently making their way south during fall migration. If you missed the fun this time around, find out how you can help next year! There have been fewer things so magical in my recent life as a mom than having raised monarch caterpillars with my two girls. 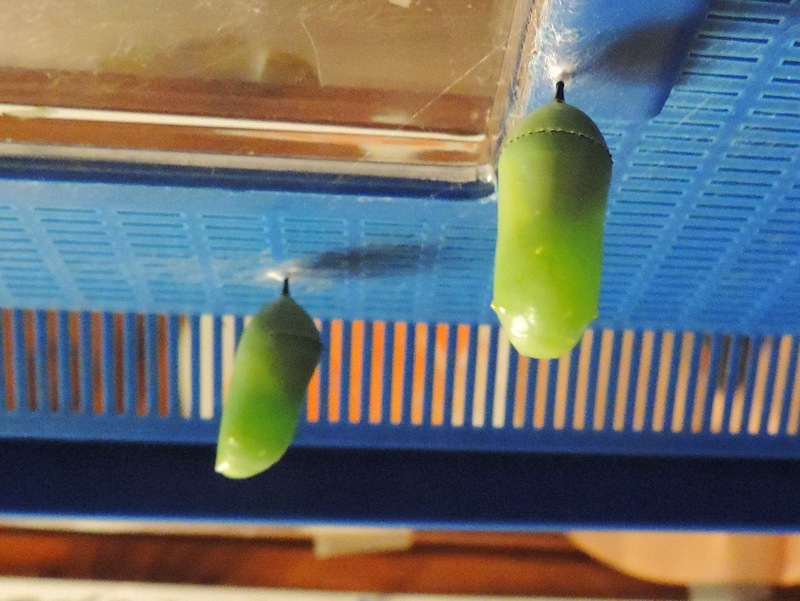 Over the last three summers we have released at least fifty and every time one emerges from its chrysalis it’s just as exciting as the very first time. We’ve even been known to eat breakfast with a critter cage full of chrysalises as a centerpiece knowing one could come out at any time. 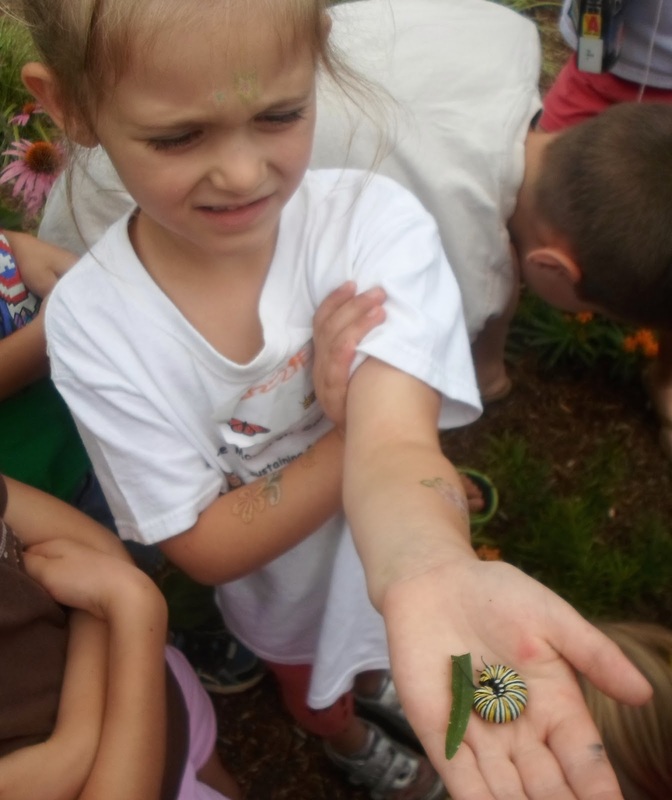 1) Find an egg or caterpillar. Easiest way to do this is find a patch of milkweed, or even better, create a monarch way station in your yard and hopefully the monarch females will come to you! 2) Look on the underside of the milkweed leaves for the tiny creamy white/yellowish eggs, monarch mommas usually choose the newest leaves at the top. The eggs are about twice the size of the period at the end of this sentence. 3) Clip the top part of the plant containing the egg, or caterpillar, bring it home and stick it in a cup of water. I find a hummus container or take-out soup container works well. I cut a small hole in the container lid so the plant stands up and the caterpillar can’t fall in the water. 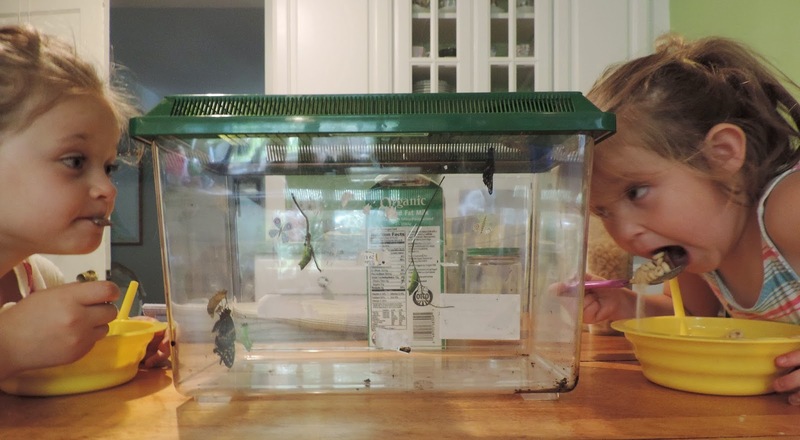 Then place the whole cup and plant in a large jar, small aquarium or plastic bin with a top so the caterpillars don’t wander all over your house when they’re looking for a spot to make their chrysalis. 4) The egg will hatch in 3-4 days and then you have a beautiful caterpillar that will grow at an incredible rate. If human newborns grew as fast, and big, as monarch caterpillars they would be the size of a school bus in 14 days! Your kids will marvel over the amount of caterpillar poo (called frass) one caterpillar can make! 5) Keep your monarch caterpillar supplied with fresh milkweed for around 14 days and you will be rewarded with a beautiful chrysalis. The caterpillar then dissolves within its new house and reforms as a butterfly in about another 14 days. Raising monarch butterflies is definitely something every kid should experience in their childhood. And with the population being down 90 percent, every female adult butterfly released is another one that can lay up to 300 eggs to help bring this species back from the brink. So plant some milkweed early next spring, look for some eggs and have fun! 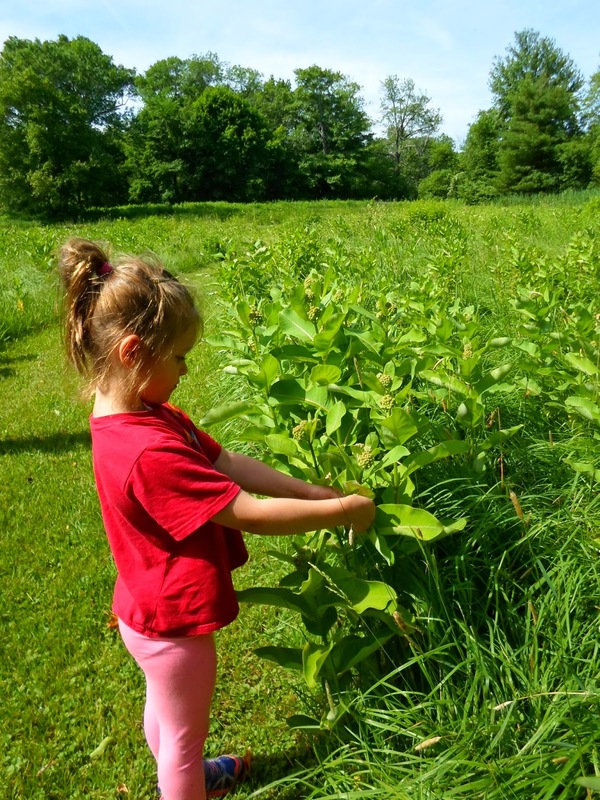 This entry was posted in Blog entries, Habitat restoration, National wildlife refuges, Partnerships, Youth and tagged caterpillar, Massachusetts, migration, milkweed, monarch butterflies, monarchs, Parker River National Wildlife Refuge, pollinators, slow the flow on September 30, 2014 by tylarjoi. i live on the West Coast of Florida and have started my own Butterfly Garden. Mostly Monarchs in my yard, Are there any programs or organizations where I can obtain free or inexpensive milkweed seeds, or any other plants to attract butterflies and offer me a variety of plants in my yard? Good question, Mary Ellen! We’ll look into this and get back to you. Tylar Greene is all about urban living and connecting people with what nature has to offer. That's why it's so fitting that she leads communications and outreach for national wildlife refuges, letting people in on America's best kept secret!